Add instant style and humour to all your photos with this hilarious Insta Photo Booth. A brilliant way to liven up your party photos and selfies, the Insta Photo Booth contains a giant picture frame in the style of a classic instant camera photograph, so you can add a retro cool framing to all your photos. There are also a whole host of different dress up props so you can pick and choose from different hats, hairstyles and more for the perfect party feel. All the dress up props are photo realistic, providing fun, laugh-out-loud pictures and poses for your photos, making them great for sharing with friends and on social media. The set also comes with reusable speech bubbles and a dry wipe pen, meaning you can add cheeky comic book style quotes and captions too. 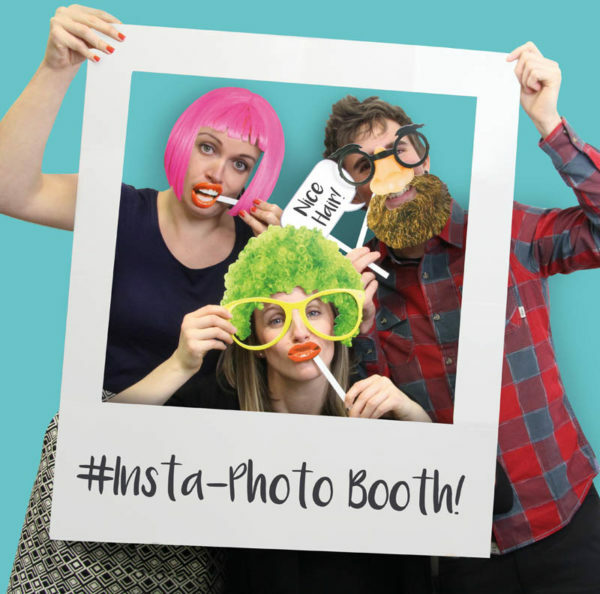 The Insta Photo Booth is great fun for parties and social gatherings, and ensures everyone gets into the spirit of things with the simple dress up props and speech bubbles. A perfect way to spice up your photos and create some truly memorable moments that will leave you laughing time and time again. The Insta Photo Booth contains 1 x photo frame, 22 x photo real props and speech bubbles, and 1 x dry wipe pen. Add instant style and humour to all your photos with this hilarious Insta Photo Booth.